We’d love your help. Let us know what’s wrong with this preview of The Luckiest Scar on Earth by Ana Maria Spagna. "Readers are along for the ride as Charlotte gets to know the complex, surprising people surrounding her—and the true meaning of that lucky scar on her father's face. Think Carl Hiaasen’s Hoot meets Jerry Spinelli's Stargirl." "The Luckiest Scar on Earth is a thoughtful novel that centers around the maturation of both a girl and her family, and whic "Readers are along for the ride as Charlotte gets to know the complex, surprising people surrounding her—and the true meaning of that lucky scar on her father's face. Think Carl Hiaasen’s Hoot meets Jerry Spinelli's Stargirl." "The Luckiest Scar on Earth is a thoughtful novel that centers around the maturation of both a girl and her family, and which intimates that sometimes the most difficult periods can also be the most beautiful." "This coming–of–age story will appeal to extreme sports enthusiasts, environmental activists, and fans of strong female characters." "It's delightful to see a female snowboarder as narrator, and readers…will find distinctive characters and an underrepresented subject." "We're right there with Charlotte as she navigates avalanche–prone back–country, races in snowboarding competitions, and searches for endangered salmon. Packed with profound questions and gems of wisdom, this story will stay with me for a long time to come." "Get obsessed; stay obsessed. I remembered these words, and Ana Maria Spagna's powerful father/daughter duo, long after I finished her captivating novel. Young snowboarders, environmental activists, and teens who champion the underdog will find themselves obsessed cover-to-cover with The Luckiest Scar on Earth." "The Luckiest Scar on Earth is a gorgeous exploration of falling in love in unexpected ways—with a new place, with a new parent, and with a new ethic. This novel is a coming–of–age in the truest and fullest sense." "Ana Maria Spagna takes the reader into a heart–stopping, snowboarding ride to vividly experience physical, emotional, and environmental scars." —CARMEN BERNIER–GRAND, author of César: ¡Sí, se puede! Yes, We Can! Fourteen-year-old Charlotte moves from the Rocky Mountains of Colorado to Washington's Cascade Mountains, where she hopes to continue training for the national snowboarding championships. After her father signs an anti-development petition, she loses access to the local resort and takes to the backcountry, where she meets nature on its own terms. When adventure turns to tragedy, Charlotte learns that even our deepest scars can be lucky ones. ANA MARIA SPAGNA lives and writes in Stehekin, Washington, a very small town in the North Cascades accessible only by foot, ferry, or float plane. She teaches creative writing in the MFA program at Antioch University, Los Angeles. Spagna writes for magazines about nature, work, and life in a small community, and is the author of several award-winning nonfiction books, including 100 Skills You'll Need for the End of the World (As We Know It), a humor-infused guide for how to live more lightly on the planet. 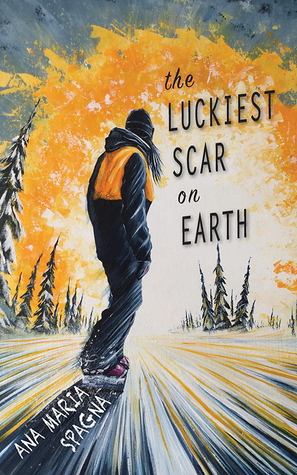 To ask other readers questions about The Luckiest Scar on Earth, please sign up. The heartfelt journey of a young woman getting to know he estranged dad while she discovers herself. Great story from an independent press about a snow-boarder girl who moves and gets to know her father. An environmental issue takes center place. Well developed characters with a clear voice. The story of 14-year-old Charlotte took me backcountry and through the twists and turns of tough decisions, loyalties, and consequences I never saw coming. My heart raced with Charlotte, with her competitive edge and daring, and when she had a change of heart, with how she coped with the unexpected. An adventure filled with nature and soaring summits, and the permission to be our true selves, I recommend it highly. Ana Maria Spagna is the author of seven books including most recently UPLAKE: Restless Essays of Coming and Going as well as THE LUCKIEST SCAR ON EARTH, a novel about Charlotte, a 14-year old snowboarder. Previous books include RECLAIMERS, stories of indigenous people reclaiming sacred land and water, the memoir/history TEST RIDE ON THE SUNNYLAND BUS: A Daughter’s Civil Rights Journey, winner of t Ana Maria Spagna is the author of seven books including most recently UPLAKE: Restless Essays of Coming and Going as well as THE LUCKIEST SCAR ON EARTH, a novel about Charlotte, a 14-year old snowboarder. Previous books include RECLAIMERS, stories of indigenous people reclaiming sacred land and water, the memoir/history TEST RIDE ON THE SUNNYLAND BUS: A Daughter’s Civil Rights Journey, winner of the River Teeth literary nonfiction prize, and two collections of essays, POTLUCK, finalist for the Washington State Book Award, and NOW GO HOME, a Seattle Times Best Book of 2004. She teaches in the MFA program at Antioch University, Los Angeles, and lives in Stehekin, Washington with her wife, Laurie.